RecoDust is believed to be an efficient way of processing steel mill dusts to produce reusable secondary raw material resources. The rising costs of the steel production process and the increasing public attention towards environmental protection have caused steel plants worldwide to focus on emission-reduction processes and circular economy. As a reusable secondary raw material resource, the steel mill dust contains a high amount of iron and zinc. Nowadays, most of the steel mill dusts are processed under the Waelz-Process. However, this process is limited or impossible without additional dust treatment and can only be operated economically with zinc contents over 20 wt%. 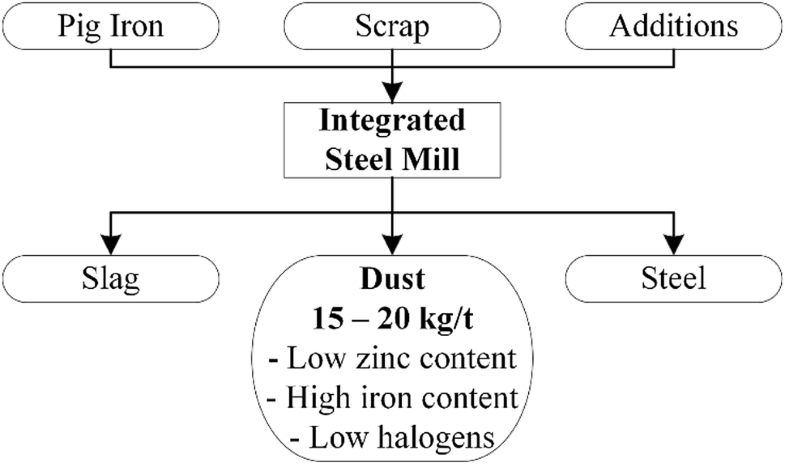 In the future, RecoDust in combination with dry slag granulation will become an efficient technique for processing lower zinc-containing materials of a steel mill. A challenging area in the field of RecoDust is the melting/reduction phase to separate volatile components and the slag treatment. A previous study was limited to the recovery of zinc. 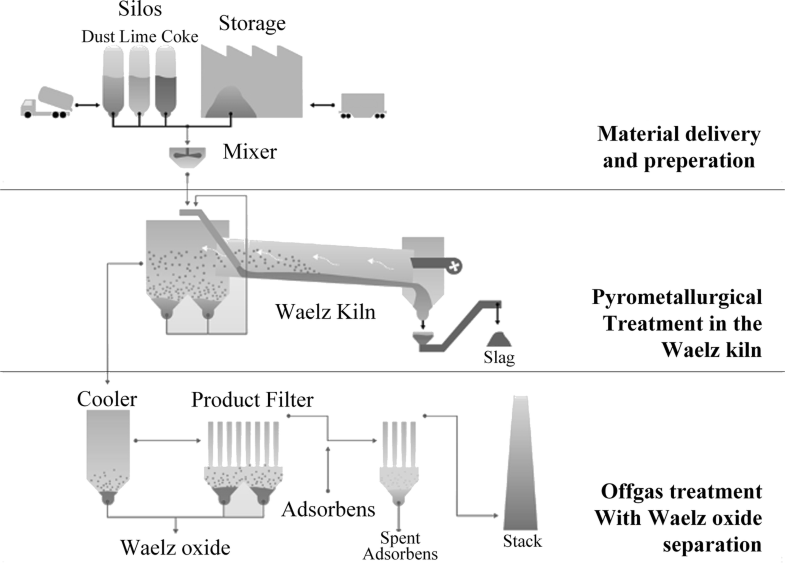 This paper compares the energy consumptions of the primary metal production to the recycling and of the RecoDust process to the Waelz-Process and outlines a new approach to RecoDust slag treatment. In general, two routes are currently used worldwide to produce crude steel. These are the blast furnace (BF) / basic oxygen furnace (BOF) route and the electric arc furnace (EAF) route . Regarding the situation in the EU-28, 162 million tons crude steel were produced in 2016, whereas 60.5% were based on the BF/BOF route, and the residual 39.5% originated from the EAF route . Fig. 1 shows the overview of an integrated steel mill for the crude steel production via the BF/BOF route. Approximately 91 million tons of hot metal were produced by this route in 2016, which amounts to 56% of the total European crude steel production . The left-hand-side of Fig. 1 shows the raw material processing. Fine ores are agglomerated in the sinter plant whereas the feed for the sinter strand consists of iron ore, fluxes for basicity adjustment (e.g., lime), iron-containing recycling materials from downstream processes, and coke breeze (fine abrasive fraction from the metallurgical lump coke) representing the fuel for the sintering process. Sinter pieces with sizes from 4 mm to 50 mm are charged into the BF . Metallurgical coke is necessary for the BF process. The coke serves as reducing agent, and energy carrier, and has a mechanical function since coke ensures stability and a certain bulk permeability inside the BF. Coke is produced in a plurality of oven chambers being combined with batteries. High-temperature pyrolysis of coking or bituminous coals up to 1,100 °C occurs in the coke ovens removing the volatile components from the coal feed . Beside coke, alternative reducing agents such as oil, natural gas, and pulverized coal are the state of the art for the BF process. In addition, hot air is needed and provided by several cowpers. The produced hot metal is tapped from the BF periodically together with the BF slag and is subsequently transported to the BOF for refinement by means of an oxygen-blowing process. The crude steel is afterward further processed and refined for the final production of tubes, wires, plates, etc. Different types of solid, liquid, and gaseous residuals are generated during the BF/BOF process (cf. right-hand side of Fig. 1). The process gases from the coking plant, BF, and BOF are used as energy carriers within the integrated steel mill. However, different amounts of solid and gaseous pollutants must be removed by means of gas-cleaning techniques such as a scrubber, electrostatic precipitator, and bag filter. Dust from the BF and BOF gas represents valuable secondary resources since these fractions contain different amounts of iron. Therefore, it is state-of-the-art techique to recycle a part of the dusts within the sinter plant, BF, or BOF. Regarding the recycling of BOF dust, only a part can be recycled, since this fraction contains considerable amounts of zinc. In case of a 100% recycling rate, zinc would accumulate within the BF increasing the demand for the reducing agent required for the hot metal production. According to the state-of-the-art process, the coarse fraction from the first BOF gas-cleaning step is recycled into the sinter plant as an iron carrier or into the BOF as a cooling agent, which is possible due to the low zinc contents (0.1 wt% to 0.5 wt%) . The zinc-rich fine dust fraction from the second BOF gas-cleaning step has zinc contents between 1 and 10 wt%, which is too high for internal recycling. Therefore, external companies treat this BOF dust fraction. However, the fine BOF dust contains up to 35 wt% iron representing a valuable secondary iron resource for the hot metal production . To be able to use this amount of iron, a treatment process is necessary, which could be installed after the BOF gas cleaning to separate the iron from the zinc fraction. A concept for the BOF dust treatment would contribute to an increased circular economy. Per ton crude steel, from about 15 kg to 20 kg of dust is generated within the BOF process (cf. Figure 2) . Assuming an annual crude steel production of 10 million tons and using the known fact that BOF dust contains up to 50 wt% iron, a secondary iron resource of approximately 75,000 to 100,000 tons of iron substitute per year can be generated for recycling via the sinter or the BF process . 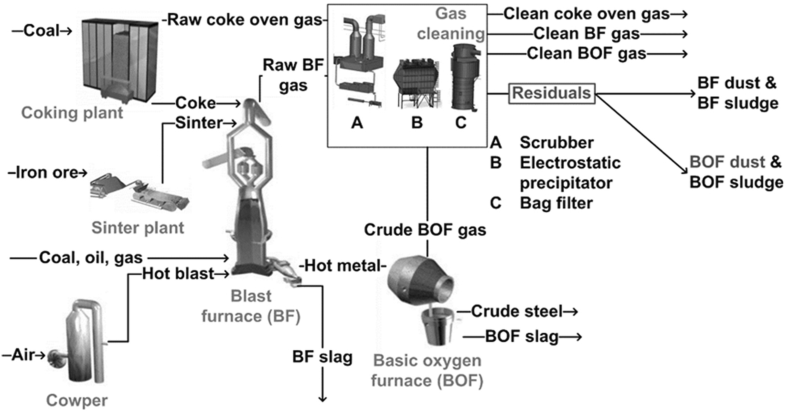 The current paper presents the research study to develop a process called RecoDust focusing on pyrometallurgical selective evaporation of BOF dust. The goal is to generate a crude zinc oxide and an iron-rich slag fraction. From a steel producer point of view, the slag fraction represents the more important product from the RecoDust process, since it serves as an iron substitute for the sinter plant or the BF as mentioned above. In the following sections of the current study, the process steps of the dust treatment are described. Furthermore, a dry-based granulation as one possible solution for cooling the slag from RecoDust process is explained. Today, the Waelz-Process (Fig. 3) is considered as state of the art to recycle steel mill dusts. Its core component, the kiln, is used to heat up the dust and additives like carbon-based substances as reducing agents to about 1100 °C. At this temperature, the contained zinc oxides are reduced and vaporized. The gas phase flows through the kiln and is cooled by air in the upper part, which leads to a re-oxidation of the vaporized zinc. By this process, large parts of the zinc, but also halogen compounds, lead, and other impurities are separated. Therefore the product quality is relatively low, which leads to limited reuse as an ore substitute in the primary zinc metallurgy. This is one of the main disadvantages of this treatment. On the other hand, the process is simple and already well known. Furthermore, its energy consumption is, compared to alternative zinc recovery treatments, relatively low. The efficiency depends on the operating conditions and the kind of primary heating source being used. One disadvantage is the high amount of residues, which are in the range between 700 and 800 kg and as high as per ton of charged steel mill dust. The fact that this process is only capable of recovering zinc while other metals, for example, iron, remain in the slag is another point, which calls for a more sustainable treatment [3, 4, 5]. BOF dusts from different integrated steel mills have different chemical compositions, depending on the different kinds of steel grades and the used scrap in the BOF process. 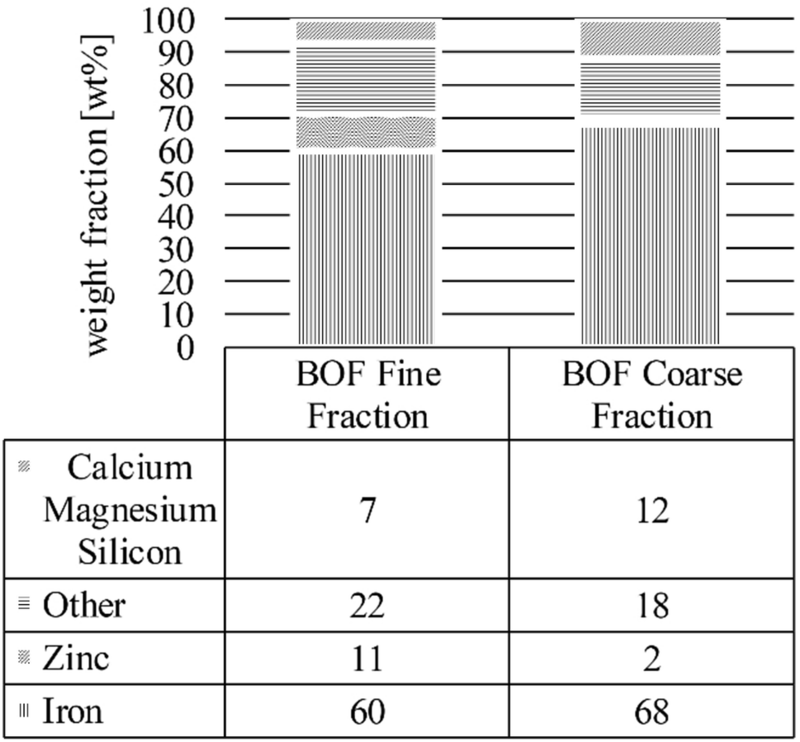 Figure 4 shows an average analysis of typical chemical composition of BOF fine and coarse dust. The high amount of iron in both fractions is a high potential for saving resources. The other components calcium, magnesium and silicon are the slag components. The biggest fraction of volatile components is zinc, not mentioned are the other volatile components like lead and halogens. Both fractions have a very high specific surface, which is necessary for fast reactions in the Flash-Reactor . In the RecoDust process, a pyrometallurgical treatment for different kinds of steel mill dusts is possible. The focus is a reuse of iron and zinc to reduce the solid waste formation to a minimum. The process uses a pyrometallurgical principle to separate volatile dust components like zinc, lead, and halogens from non-volatile components like iron, magnesia, and calcium, using reducing process conditions and high temperatures. Under these conditions, the fine dust melts, and the zinc oxide is reduced and vaporized. The zinc gas leaves the Flash-Reactor with the exhaust gas and is oxidized to zinc oxide. The non-volatile elements and oxides accumulate at the bottom of the reactor and can be tapped off. 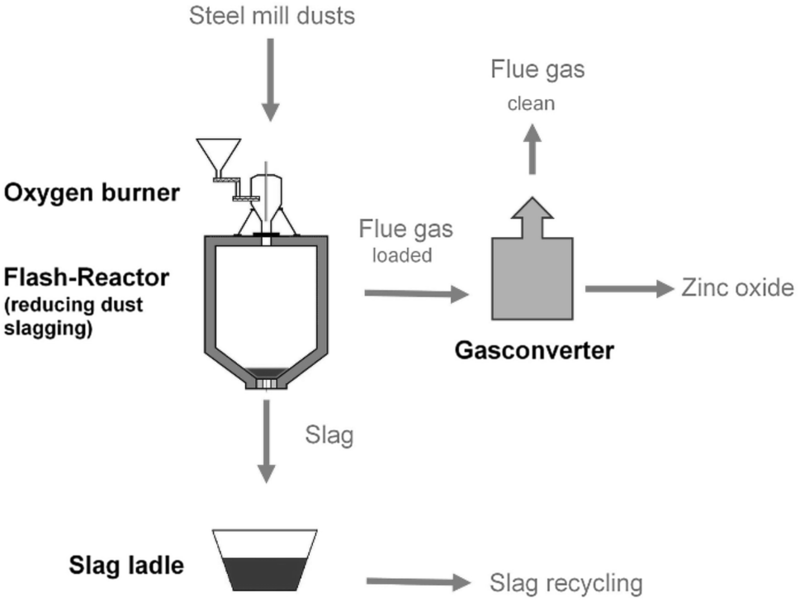 The single-step RecoDust process is shown in Fig. 5 . The first method for the treatment of RecoDust slag is the slag pit process (also called cooling in air). The molten slag is poured from ladles directly into slag pits. The slag slowly cools down and crystallizes in air atmosphere. The pits are alternately filled and excavated. After that, the slag is broken up, crushed and sieved for internal recycling . Alternatively, the Dry Slag Granulation (DSG) process can offer a very simple low-cost option for slag disposal in the first step with only a spinning disk and slag runner. The granules can be atomized by the disk into a slag pit and gathered using a loader after each tapping (Fig. 6, left). With this simple method, the slag treatment steps crushing and sieving can be avoided. The DSG concept is based on the centrifugal atomization of liquids using a variable speed rotating disk (RDA). The slag is fed onto the center of the disk. The rotation of the disk forces the slag outward to the lip where it is atomized. 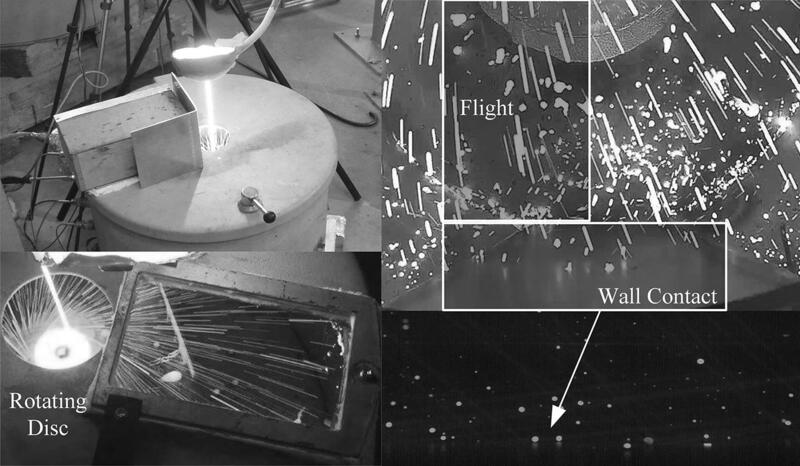 The ligament breaks up into several molten slag drops in the flight and produces uniform droplets (Fig. 6, right). The resulting slag droplets are cooled by air within their flight [9, 10]. The RecoDust process provides two products, an iron-rich slag on the one hand, and a crude zinc oxide suitable for internal and external recycling on the other hand. 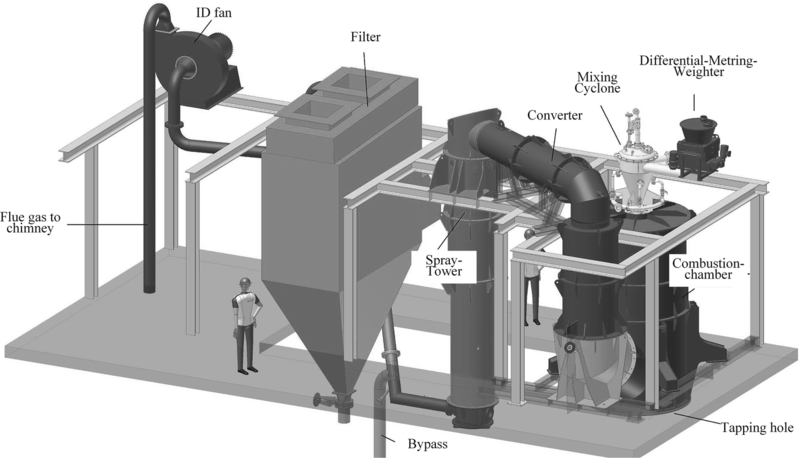 Therefore, the RecoDust process can be described as highly efficient (Fig. 7). By having no internal iron- and zinc-cycle and not producing any waste material, except exhaust gas, RecoDust is not only efficient but also effective. The process is suitable for different input material compositions and flexible in possible facility sizes. Regarding the energy efficiency, the RecoDust process needs a high amount of energy to provide the needed temperatures up to 1900 °C. However, by implementing an energy recovery step in a possible industrial application, energy consumption will decrease. Based on this assumption, the RecoDust process fulfills many demands on the efficient and effective recycling process . The single-step RecoDust process was realized in a pilot plant, the Flash-Reactor, with a maximum capacity of 300 kg/h. The process principle, visualized in Fig. 8, is divided into four basic steps and can be explained as follows. The first and crucial process step is melting and reducing of the dust components. The Flash-Reactor head, designed as a combination of burner unit and mixing/melting cyclone, enriches the input material with pure oxygen. The dusts undergo a rotating flow and are directly fed into a reducing natural gas–oxygen flame. Due to reducing conditions and due to the high temperature in the reactor chamber, the volatile target component zinc is reduced and transferred into the gas phase rather quickly. The temperature is generally set at about 1700 °C and can be increased up to 1900 °C, depending on individual dust characteristics. The special working mechanism of the Flash-Reactor head enables fast reducing and vaporizing, which is essential for the RecoDust process. The separation of zinc and iron should be done during the particle flight; if not the reaction speed in the slag bath is very low. The reduced elements such as zinc and lead leave the reaction chamber with the flue gas together with other volatile components such as halogens and the so-called “Carry-Over”, which mainly consists of unreacted iron and calcium. The next process step is engineered as a converter where all reduced elements are transferred in their stable oxide phases by oxidizing them with pure oxygen. In addition, water is added to start the cooling of the exhaust gas from about 1700 °C down to 800 °C after the post-combustion process. In the third step, further cooling with water and subsequently with air decreases the exhaust gas temperature to about 150 °C. In the fourth and the last process step, the flue gas passes through bag filters to separate the dust particles, and the purified gas can be released into the atmosphere. The zinc-rich filter dust is discharged batch-wise. In Fig. 9, a 3-D sketch of the pilot plant in Leoben is shown [7, 8]. The benefit of the RecoDust process is the absence of foregoing treatment steps for the dusts. The RecoDust process is only limited by a small number of requirements regarding the input dust properties. The dusts must be dry and should have a grain size less than 1 mm due to the need of a fast melting procedure. Unlike most other established processes, no additives are charged into the process, the reducing conditions are adjusted only by controlling the oxygen flow in the mixing cyclone and the burner lance. With this setup, a quick reaction on inhomogeneous input materials, especially changing iron and zinc contents is feasible. According to shorter retention times, a compact plant design can be realized, and it can be installed independently on a production site. 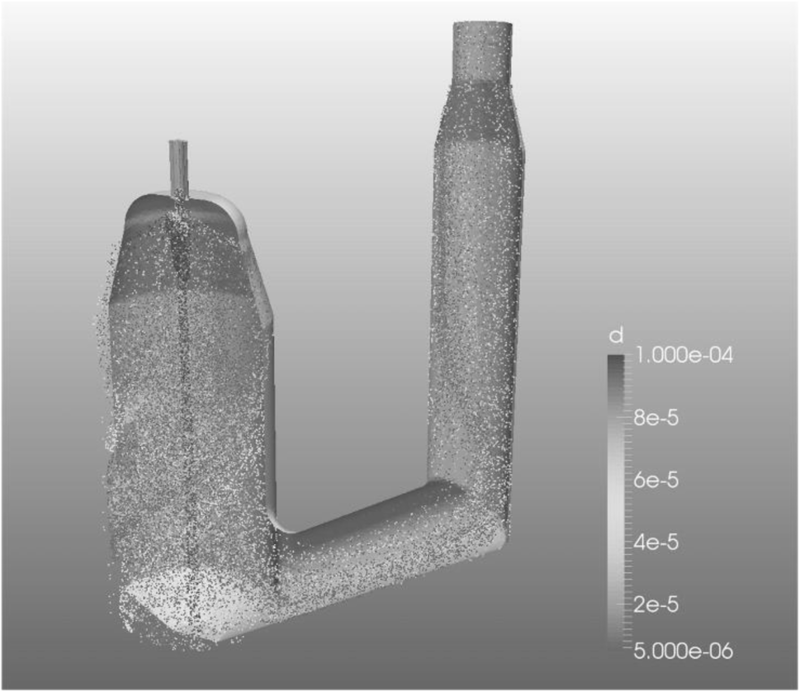 CFD-modeling supports the development of the RecoDust process. It is mandatory for the scale-up of the pilot plant to understand the conditions inside the reactor. Figure 10 shows the particle distribution colored by particle diameter in the reactor and the pipe before the converter. The particles follow the velocity streamlines depending on the particle size and density . A series of DSG trials were carried out using molten RecoDust slag at the Montanuniversitaet Leoben. In Fig. 11, the laboratory atomizer is shown. The main parts are the rotating disk and the water-filled deflector walls. The liquid Flash-Reactor slag was filled in with a skimmer. The rotational speed of the spinning disk was between 1200 and 1800 rpm. In Fig. 11, the atomization of the liquid RecoDust slag to small droplets is shown. To compare the energy demands of the RecoDust process, the comparison in terms of energy needs for primary steel and zinc production is shown in Table 1. The results are divided into the main processes of the production . The findings of this study indicate that an average cumulative energy demand of 4 MJ/kg iron and 8.1 MJ/kg zinc can be avoided by the reuse of the RecoDust products. In general, the energy efficiency of the RecoDust process depends mainly on the input material and the oxygen/natural gas ratio (air excess ratio lambda) of the burner. For example, the combustion at 1,700 °C with a natural gas/oxygen ratio of 0.9 delivers 68% more energy than by combustion with an oxygen/natural gas ratio of 0.7 . Table 2 shows that the needed oxygen/natural gas ratio depends on the zinc content of the input dust and the required zinc content of the RecoDust slag. Low zinc content in the RecoDust Slag is necessary for being used as an input material in the sinter plant. Hence, a higher amount of natural gas will be accepted. In the following Table 3, the energy demands of the Waelz-Process and RecoDust process are compared to ensure this quality requirement. The research study on the RecoDust process shows that based on an initial estimate, the RecoDust process provides an efficient way of processing steel mill dusts compared to the Waelz-Process. The main goal of these test trials was to optimize the process parameters in order to achieve a constant product quality despite changing input materials. Based on the generated high zinc removal rate, the efficient zinc recycling of steel mill dust is achievable. The only limitation for the use as a secondary resource in the zinc industry could be an enrichment with other volatile components especially halogens. All volatile components from the input dust are enriched in the crude zinc oxide product. The satisfying dezincification in the RecoDust process provides zinc contents in the final slag product below 0.5 wt%. To recycle the RecoDust slag in the sintering process also a well-defined grain size is needed. For example, a requirement for using fine iron ore as sinter plant input material is a grain size between 0.1 to 10 mm . Figure 12 shows the products of the RecoDust process including crushed and dry granulated slag . From a material processing point of view, the RecoDust slag is a very hard, stable, and not a leachable product. Slag particles treated by cooling in a ladle with a subsequent crushing and sieving, show a high abrasion caused by the iron content more than 50 wt%. The grindability index R (Rittinger coefficient) of the RecoDust slag is lower than ladle slag or martite ore, see Table 4. This is an indicator for a high energy demand for crushing the RecoDust slag after cooling in a ladle or slag pit. No crushing and sieving (costs/energy). Lower capital and operating costs. Product quality (grain size distribution). The potential for energy recovery. In Table 5, the cumulative energy demands of primary iron and zinc production are compared to the RecoDust process. It is shown that the primary production consumes less energy than the dust treatments. These results thus need to be interpreted with care. They just provide a first approximation and do not include any optimization of the pilot plant. Compared to the Waelz-Process, the RecoDust process is more efficient without including the necessary pre-dust treatment for the Waelz-Process. This study aims to give attention to high potential secondary material resources, which are steel mill dusts. 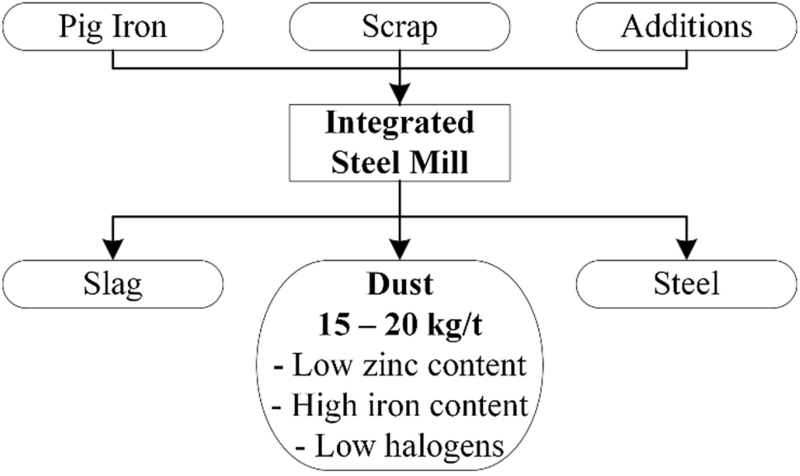 In a series of experiments, the suitability of the RecoDust process for iron and zinc recovery from steel mill dusts was investigated. 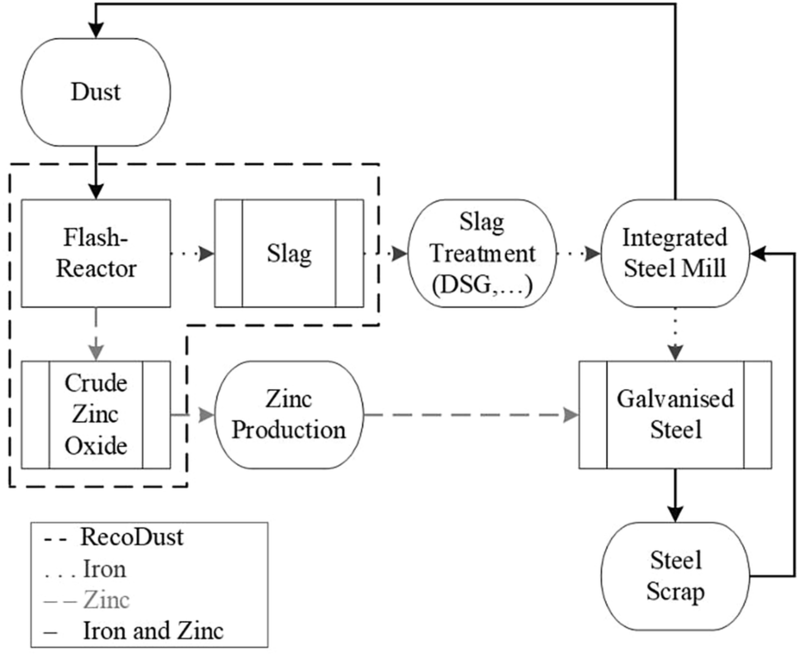 The product analysis promises a possible way of closing the iron and zinc loop within the integrated steel mill by combining the RecoDust and the Dry Slag Granulation (DSG) process. Results so far have been very promising for an efficient way of processing steel mill dusts. Research into optimization of the RecoDust process with special focus on burner design and dust feed is an open challenge. Future work will concentrate on a feasibility study, which should also include the cumulative resource demand and costs of the processes. Open access funding provided by Montanuniversitaet Leoben. 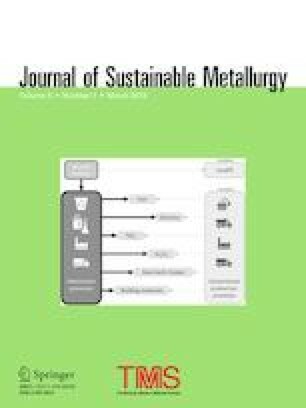 The authors gratefully acknowledge the funding support of, K1-MET GmbH, the metallurgical competence center. The research program of the K1-MET competence center is supported by COMET (Competence Center for Excellent Technologies), the Austrian program for competence centers. COMET is funded by the Federal Ministry for Transport, Innovation, and Technology; the Federal Ministry for Digital and Economic Affairs, the provinces of Upper Austria, Tyrol, and Styria, as well as the Styrian Business Promotion Agency (SFG). Besides the public funding, the project is financed by voestalpine Stahl, and voestalpine Stahl Donawitz.